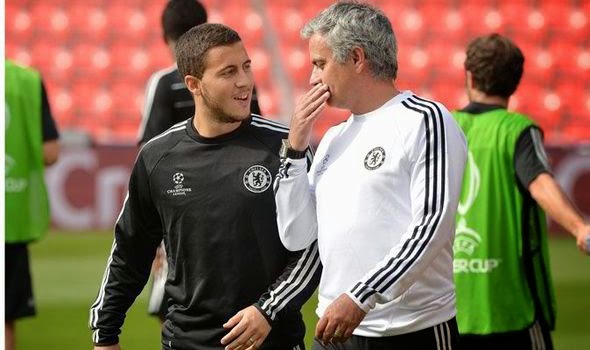 Jose Mourinho and Eden Hazard both rule out Chelsea exit. The speculation surrounding the future of Eden Hazard has quite literally died a death after two quotes made by Jose Mourinho and Hazard himself re-affirming his commitment to Chelsea. For weeks now all we heard about was how PSG and their mega millions were going to offer Chelsea huge amounts of money (which they now can't afford to do) to take Hazard back to France. Especially after David Luiz was sold, plenty of people speculated about Hazard and as much as £60m being offered to Chelsea to tempt them into selling. Of course this has not materialised and if anything, no one has ever considered the clubs position on this story until now. Last week, I posted the first of two quotes made by Hazard as he stated that he has a contract with Chelsea and wanted to stay. Now, in addition to that, Jose Mourinho and Eden Hazard have put an end to any speculation. "Just because I say that Eden does not have everything, it doesn't mean I don't want him. He has fantastic potential and will express it at Chelsea. For him, as for others, the door is closed. People who know me know that, when I say that, I mean it." "I am staying at Chelsea, [that is] 100 per cent sure. I am in discussions with Chelsea for a new contract. It is only the beginning of the talks right now so we have got time but the fact that Chelsea have offered me a new deal means that they have got a lot of confidence in me that I can do a good job and that they can count on me." It's great news for the club, for the manager, the supporters and for Hazard himself to be rewarded with a new deal and feeling that he has the trust of everyone here. As you imagine, the Hazard to PSG link has died a death and now we can all concentrate on watching his performances in the World Cup which if this season is anything to go by, he will be a star!